Just in time for the summer harvest of so many fantastic vegetables, I became the very excited owner of a spiralizer. This was thanks to my sister Julie, who knows me so well. 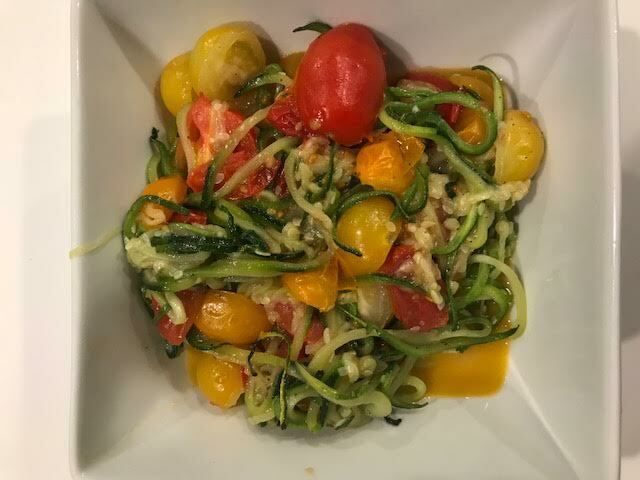 I’ve been a huge fan of zoodles (spiralized zucchini) and all other spiralized veggies (carrots, butternut squash, potatoes, beets), typically buying them at Wegman’s. Now – when I buy them already in their spiralized state they are expensive. As in $7 for a little tiny package of zoodles. The other problem with buying your veggies already spiralized is they have a shelf life of zero. They get scary-mushy well before their sell-buy date. My sister Julie is an avid gardener. She harvests loads of fresh vegetables all summer long, so it was only natural that she would become a spiralizer-owner early on. She strongly recommends investing in a quality spiralizer. She gave me the OXO Good Grips Table Top Spiralizer. I was in love at my first spiral! Like so many OXO products, it did not disappoint. It’s solid. It has great suction and really fastens itself to my counter-top. It’s super-fast. Julie works from home as a Pilates instructor and she spiralizes vegetables in-between clients. 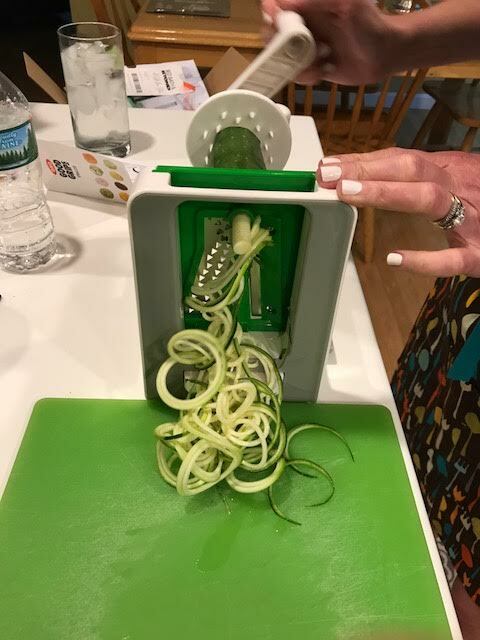 Knowing I had my spiralizer, I bought some extra zucchini at Ward’s Berry Farm and put my new gadget to the test. It was so easy to use, right out of the box. I was able to whip up a fun side dish by sautéing the spiralized zucchini in a teaspoon of olive oil, adding some grape tomatoes, Kalamata olives and a little parmesan cheese. Delicious! The OXO Spiralizer goes for about $40 at Bed Bath & Beyond. I figure it’s worth it considering all I was spending buying pre-packaged spiralized veggies. I can’t wait to try it out with all the amazing vegetables that we’ll be receiving in our CSA box this summer. Spiralizers are so popular, there are whole blogs dedicated to spiralizing. Check out the Inspiralized blog for inspiration. I highly recommend investing in a quality spiralizer. It will encourage you to eat more vegetables (always a good thing). I’m so glad I have one and I’m looking forward for a summer of new recipes!